Healthy GOO’s “Roots” are the result of Stephen’s decades of Neutralizing Enviro Allergies in Us Humans with his Product called GOOy CHEWy Relief. GOOy CHEWy Relief is a Honey-Based Lozenge which builds Immune Tolerance to 14 of the Major Aero-Enviro “Human” Allergy Sources i.e. multi-Grass / Tree / Weed Pollens, Dust Mites / Molds, Cat & Dog, Cockroach. 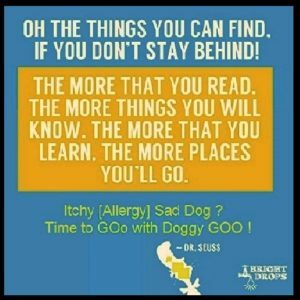 The “AhHa Moment” for Doggy GOO came when Stephen was visiting his local Pet Store and discovered that our Canine Best Friends suffer from Allergies to the same Enviro Allergy Sources as Us Humans. Following this “Canine AhHa” Moment, Stephen spoke with his Human Allergy Medical Director / MD & it was determined that the Same Immuno-Allergy Methodology that was currently being used to Neutralize Aero-Enviro Allergies in Us Humans i.e. GOOy CHEWy RELIEF could be Applied to our Canine Friends with Enviro Allergies. Following this Allergy Revelation, Stephen enlisted the Scientific & Medical Hep of a DVM Allergist / Dermatologist Consultant to Formulate GOO-Licious Doggy GOO. After which he created the Company called Healthy GOO ! And, as they say, the Rest is GOO History. 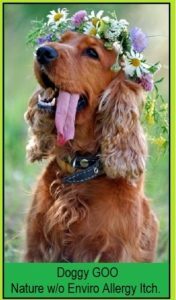 Hear / Learn – ALL about Canine Enviro Allergies in our Dogs. 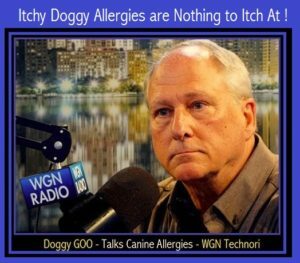 WGN / Chicago / Technori Radio Interview with Stephen ( Doggy ) GOO ! 70% Itchy / Paw Chewing / Gunky Ear / Skin Issue > Dogs = Enviro Sources. 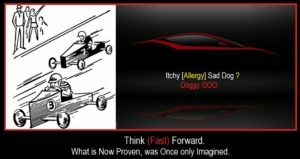 Then, visit www.HealthyGOO.com and Learn all about Doggy GOO and Read PET Parent GOO Testimonials.
.  GOO-Licious Peanut Butter Treat. Your Dog will Doggy GOO Lick IT Up ! Sincerely, Stephen Hauer M.S.M. M.B.A.